Bring a large pan of water to the boil. Carefully cut a small X shape into the side of each chestnut. Boil the chestnuts for 20 minutes. Drain and using a small paring knife remove shell and skin. Place 250g of the shelled, roughly chopped chestnuts into a small saucepan along with milk, sugar and 1 cup of water and boil for 15-20 minutes, or until the chestnuts are tender and most of the liquid has evaporated. Place in a food processor, and blend until smooth. Set aside to cool. (The remaining chopped chestnuts will be used for the toffee). Place the chocolate in a medium heatproof bowl and place over a saucepan of simmering water (making sure the bowl doesn’t touch the water). Stir for 5 minutes or until the chocolate has completely melted and is smooth. Remove bowl from the heat and set aside for 3 minutes to cool slightly. Add the egg yolks and stir until well combined. 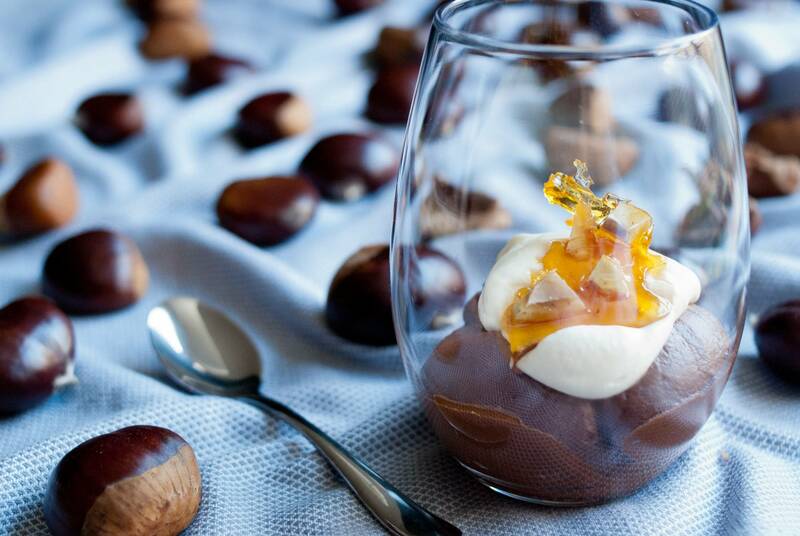 In a separate medium size clean bowl, place the cream, 150g of the chestnut puree* and vanilla extract. Whisk until soft peaks form. Use electric beaters to beat the egg whites in a large, clean dry bowl until soft peaks begin to form. Gradually add the caster sugar, 1 tsp at a time, beating well between each addition, until the sugar dissolves. Fold the chocolate mixture into the chestnut cream mixture, until well combined. Add approx ¼ cup of egg whites to the chocolate cream mixture and stir thoroughly to loosen the mixture. Fold the remaining egg whites gently into the chocolate cream mixture until evenly combined. Spoon the mousse mixture into four serving glasses or dishes. Cover with plastic wrap and place in the fridge for 3 hours, or until chilled. Chop the remaining chestnuts into small chunks and place on a sheet of baking paper, clumped together. Place sugar and 2 teaspoons of water in a small saucepan over low heat, stirring, for 3 minutes or until the sugar dissolves. Increase heat to medium-high and bring to the boil. Boil, without stirring, brushing down the side of the pan with a pastry brush dipped in water for 10 minutes or until golden. Pour over the chestnuts and set aside to set. Top each mousse with whipped cream and break off a bit of chestnut toffee shard. *There will be some chestnut puree leftover, try it stirred through Greek yogurt for breakfast.